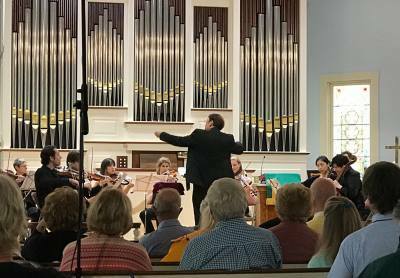 Founding artistic director, conductor, and baroque violist Mark Bailey is extensively involved in the performance of baroque, classical, and early romantic instrumental, vocal/choral, and operatic works. He is founding artistic director of the American Baroque Orchestra (and through it the American Baroque Singers), and he frequently guest conducts renowned ensembles, such as the Portland Baroque Orchestra, Edmonton Symphony Orchestra, Cappella Romana, and Pro Coro Canada. As well, Mr. Bailey often is invited to give seminars on conducting technique, performance practice, and Slavic baroque music, as he has at the Mostly Mozart Festival at Lincoln Center, the Tafelmusik Baroque Summer Institute in Toronto, Canada, the University of Oregon Musicking Conference, and the Performance Practice Institute Conference at Indiana University. Other guest appearances include conducting two gala concerts by invitation at Carnegie Hall, featuring the music of Moscow and St. Petersburg. Through his work as conductor of the American Baroque Orchestra, Mr. Bailey has uncovered and revitalized lost repertoires of the 17th and 18th centuries. In addition, he has discovered numerous new perspectives on performance practice regarding beloved masterworks of the period. 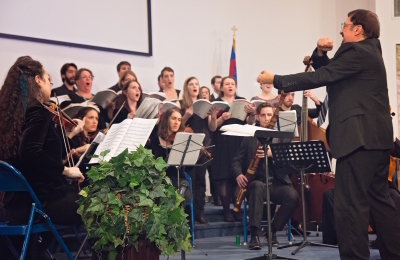 Mr. Bailey's rendition of Handel's Messiah, for instance, revitalizes many lost musical elements of Handel's earliest versions, based on the scores Handel himself used. Mr. Bailey is also project director of Ukrainian Voices: Music of a Nation, for which he concertizes and promotes the music of Ukrainian-born composers from the baroque, classical, and early romantic periods. 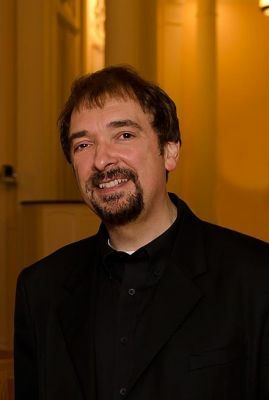 Mark Bailey's recordings have been acclaimed by The New York Times critics’ choice list and praised by National Public Radio’s Performance Today. His most recent commercial recording, “Heart of Kyiv,” features Slavic works of the 17th and 18th century, with Mr. Bailey leading Pro Coro Canada. Among many fine reviews of Mr. Bailey’s concerts, Northwest Reverb wrote of his collaboration with Cappella Romana: “...the choir followed Bailey’s detailed, expressive direction with rapt focus...they sounded like one solitary living creature, the expansion and contraction of the music coming as naturally as breath.” Mr. Bailey's 2015 performances of the Rachmaninoff All-Night Vigil, also with Cappella Romana, earned him several fully positive reviews as well, both in Seattle and Portland. Mr. Bailey is also an active composer whose instrumental and choral compositions/arrangements have been performed by ensembles such as the Tafelmusik Baroque Orchestra and have premiered at Lincoln Center, Yale University, Boston’s landmark Emmanuel Church, and throughout the United States, as well as at St. Basil’s Cathedral in Moscow, Russia. Approximately forty of his compositions have been published. Mr. Bailey also founded the Composer’s Seminar at St. Vladimir’s Orthodox Seminary, where he served on the faculty from 1992 to 2008. In addition to composition, Mr. Bailey is an active baroque violist, exploring performance practice across the centuries. He is a founding member of the Musica Vera Duo, with guitarist Kevin Sherwin. In the field of performance practice research, Mr. Bailey is head of Yale’s renowned collection of Historical Sound Recordings. At Yale, he also is faculty adviser of the Tiny Baroque Orchestra of Pierson College and was artistic director of the renowned Yale Russian chorus for 20 years. Mr. Bailey earned his undergraduate music degree at the Eastman School of Music, where he was also an assistant conductor for the Eastman Philharmonia, the Eastman School Symphony Orchestra, the opera department, and, by extension, the Heidelberg Castle Opera Festival, Heidelberg, Germany. He then earned is masters degree in conducting from The Yale School of Music (through the Yale Institute of Sacred Music), Yale University. He has studied orchestral conducting principally with Harold Farberman, David Effron, and Daniel Lewis, and choral conducting with Marguerite Brooks. Outside of music, Mr. Bailey is a state commissioner for the Connecticut Task Force on Animal Welfare and a member of the advisory board for Connecticut Votes for Animals, reflecting his passion for humane legislation and welfare. To learn more about Mark Bailey, visit www.markbaileyconductor.com.